The Vancouver Condo Buzz » New Vancouver Commercial Property for Sale > Broadway Central Neelu Bachra Centre features Vancouver Class A Office Space > 124 Strata Offices Starting from $299,900! New Vancouver Commercial Property for Sale > Broadway Central Neelu Bachra Centre features Vancouver Class A Office Space > 124 Strata Offices Starting from $299,900! 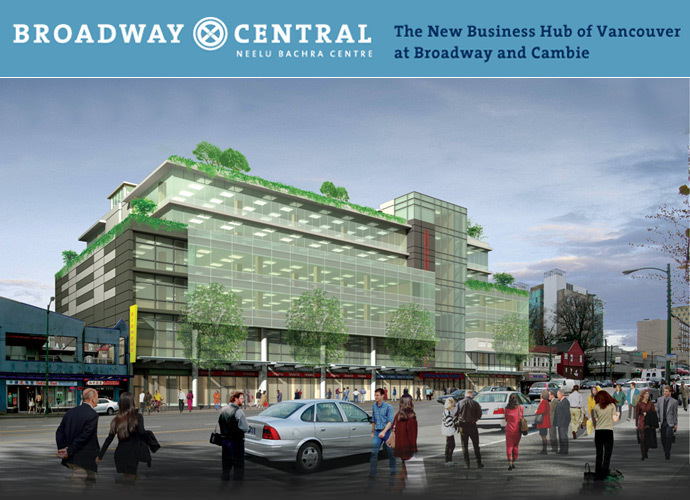 Situated at Cambie and West Broadway in Vancouver Westside real estate district, the new Vancouver Broadway Central office space is a new development that will bring one of the best investment opportunities to the city. For those who are into residential real estate property investing (like condos, townhomes and homes), the Vancouver commercial real estate boom is only starting, leaving you with the possibility of great gains and cash flow in the near and longer term. The Broadway Central Vancouver commercial office space for sale is a rare collection of only one hundred and twenty four (124) Vancouver Class A strata offices located at a great corner at West Broadway and Cambie Street. This central location is a key to the great success of the project where investors and property owners at the Class A Vancouver commercial office space at Broadway Central will command high growth, high traffic and high demand for a long time. Not only that, but many of the Broadway Central Class A Vancouver commercial office space for sale will also have great views of the North Vancouver mountains, Burrard Inlet and water as well as the downtown Vancouver city skyline. Not only that, but tenants at the Class A Vancouver strata offices will be close to the Vancouver General Hospital, Broadway/City Hall Canada Skytrain Line Station, Vancouver City Hall, lots of big box stores, boutique shops, cafes, diners, fine dining and local conveniences. Be with the best. Major international retailers are just steps away from Broadway Central Vancouver Neelu Bachra Centre, which will be part of the 2nd largest office district and employment centre in Canada. For more information, please visit www.broadwaycentral.ca. Again, there are only 124 Vancouver Class A strata offices available for sale starting from $299,900. The brand new Class A Vancouver view offices are the first of its kind in this district in quite a while and will become the new business hub of Vancouver at Broadway and Cambie. Vancouver Broadway Central Neelu Bachra Centre. 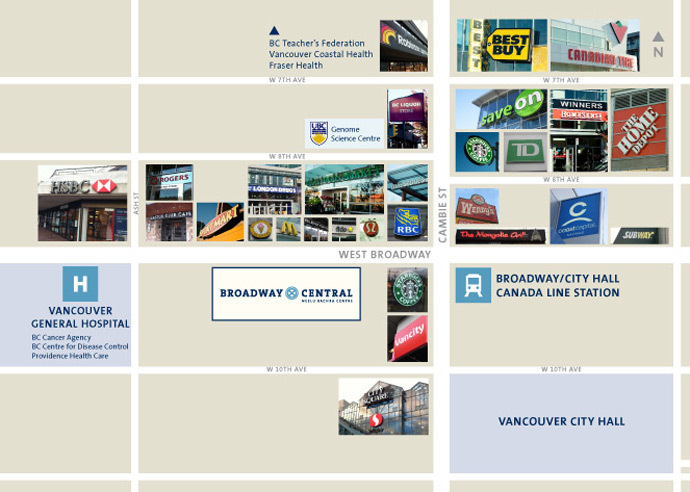 The Broadway Central Vancouver presentation centre is located at 552 West Broadway Vancouver. Creating wealth through Vancouver commercial real estate has always been a very big secret. With all the residential development built out in downtown Vancouver, not much of the displaced office space has been replaced … until now. The Broadway Central Vancouver commercial real estate development is the perfect opportunity for you to control your own rents, work from a brand new view office that will impressive your employees and your clients in addition to gaining long term capital appreciation and value. Or, as a Vancouver commercial real estate investor, the Vancouver Broadway Central Neelu Bachra Centre represents the ideal opportunity to invest in a long-term asset where office space comes at such a huge premium in this beautiful city. From a proven location at Broadway and Cambie to an exceptional growth potential of the 2nd busiest office district and employment centre in all of Canada, the new Broadway Central Vancouver strata offices for sale will start from less than $300k! That’s the price of a studio suite in downtown Vancouver! Some of the statistics are staggering for the Broadway Vancouver office district: there are thirty per cent more JOBS & POPULATIONS projected by 2041 in this region in addition to a two hundred per cent increase in TRANSIT TRAFFICE between 1997 to 2009 and over 76,000 mass transit trips per year! The Broadway Corridor has even more going for it, which bodes well for investors at the Broadway Central Vancouver strata offices and commercial real estate development where over 15 million cars pass through Cambie and Broadway per year in addition to over 38 million mass transit trips are made down this corridor. This location is also the 2nd most popular transit route/destination in Vancouver a swell as the busiest three pedestrian blocks. The new Broadway Central Vancouver Class A office space will also be centred around the top 1% of income earners in the city in addition to the highest stability in occupancy over the past six years. Not only that, but it is also the top two highest occupancy rates in Greater Vancouver! The Vancouver Broadway Central Class A Strata Office Space is all about the golden opportunity to build wealth and to invest in an asset that will provide you benefits in the short and long term. This golden opportunity in new Vancouver commercial real estate is because of its impeccable Cambie and Broadway location coupled with the rarity of ownership of Class A Vancouver office space. For the short and long term, you will also have the security of income generation. Also, you can diversify out of other assets such as residential real estate, stocks, bonds, cash, precious metals and into Vancouver commercial office space with lasting value. Also, this Class A Vancouver office space will allow you to invest with ease, allowing you low maintenance management where your tenants will even pay for the maintenance, property taxes and any strata fees incurred during their stay. Also, there is a fitness centre, a roof deck and extensive professional landscaping throughout the property.